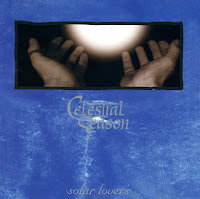 Celestial Season formed as a unique formation that tried to mix death/doom with classical music influences. Nowadays it's sound like nothing new, but their second album probably belongs to the best and earliest similar experiments that was ever made. Still "Solar Lovers" is a barely known and very underrated record. The way how they involved violin into doom themes creates a melanholic hamony that couldn't be compared to any similar tryings and it's far more effective than creating some simple atmospheric sound. "Forever Scarlet Passion" was a raw trying, but on the second album they found the perfect way how to compose together these definitely not related styles, and it fits well to their lyrics based on nature, sorrow and lovesickness. The other thing why the album is interesting is that they also involved stoner rock influences. That was a sign of their late style already, so "Solar Lovers" may count as a turning point too that predicted their late style. The album by this combination counts as one on the most genuine events even in the main metal scene and an evergreen masterpiece that couldn't be re-made.